At the heart of Kandji are Parameters: The individual policies that are available to secure your businesses Macs. Parameters are pre-coded and validated with each update of macOS. Kandji currently offers over 130 Parameters to choose in its ever-growing library. The library has been built specifically for companies who need to be compliant with standards like CIS, HIPAA, and NIST. Some Parameters are as simple as turning on a light switch, for example, Enabling Firewall. 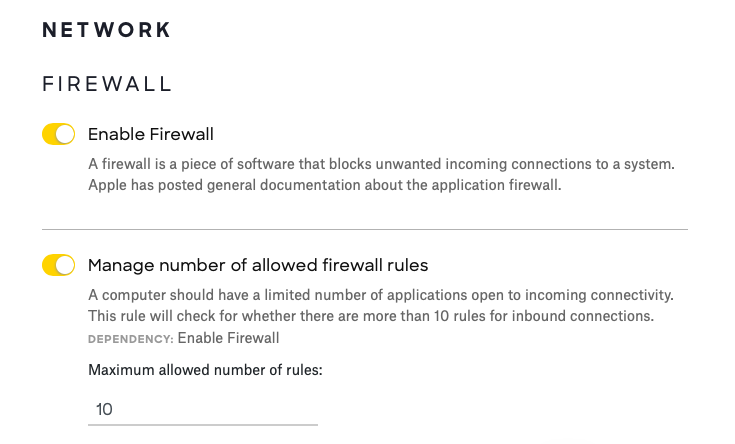 More advanced parameters easily allow you to set custom variables, for instance, Manage the number of permitted Firewall rules. Once deployed, all of your selected Parameters are regularly checked for compliance and even remediated when discrepancies are detected. You can also easily generate and review each Parameter's detailed compliance history in the Kandji Web App. Sign up for Kandji today, and see the library for yourself. It's never been easier to secure your fleet of Macs.